"Your Destiny Is In Your Blood." 20th Century Fox has released a second official trailer for the adaptation of the video game series Assassin's Creed, starring Michael Fassbender, giving us yet another look at this action movie. Fassbender plays Callum Lynch, who is sent back in time as his ancestor Aguilar. The cast includes Marion Cotillard, Jeremy Irons, Brendan Gleeson, Michael Kenneth Williams, Callum Turner; plus Ariane Labed. This trailer highlights more of the impressive action in this, but also spends time introducing us to the futuristic framing of the movie - Lynch being involved in this program. Perhaps playing off of the hype for Westworld a bit, maybe? Either way, this looks damn good - I'm excited to see it. You can still see the first trailer for Assassin's Creed here, plus behind-the-scenes & "leap of faith" videos. Assassin's Creed, created by Patrice Desilets & Jade Raymond back in 2007, is an award winning historical fiction action-adventure open world stealth video game series that as of 2012 consists of five main games. The focus is on a protagonist character, an assassin, who usually wears a hooded outfit, which became the focus of their latest marketing campaign for AC: Revelations. The movie based on Assassin's Creed is being directed by Australian filmmaker Justin Kurzel, of The Snowtown Murders and Macbeth previously. The screenplay has credits for Bill Collage, Adam Cooper and Michael Lesslie. It was filmed around Malta. 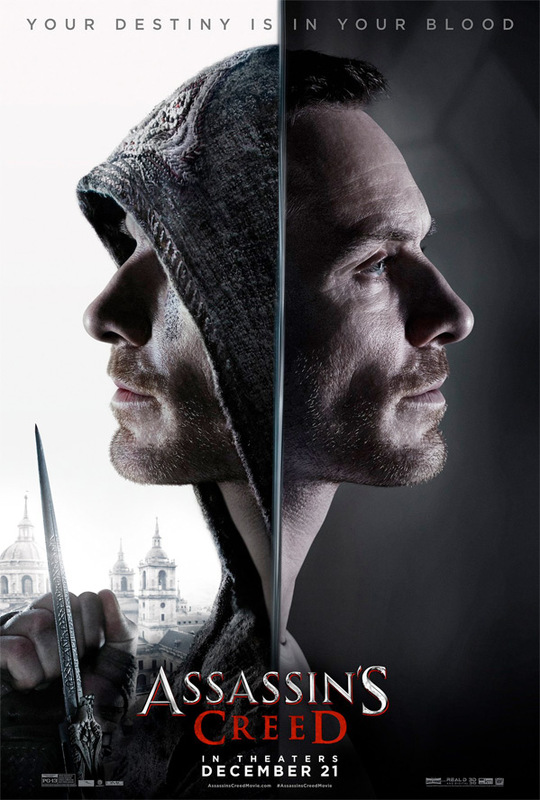 20th Century Fox will release Assassin's Creed in theaters everywhere starting December 21st. Excited for this? This trailer would've been much better with different music, this song didn't fit at all. Still have faith the movie will be good though. Crap! Why did they ruin the trailer with this awful music? Should at least be interesting. They are fitting quite a bit of story into the plot. Looks like at least a 2.5 hour affair. Looks pretty entertaining, far better than the first trailer. Please be good! Please be good! The present day part of the game was always boring exposition. Hopefully they spend less time there and more time with the historical fiction aspect of the story.